PORT TOBACCO, Md. - Tucked away in the woods, not far from the College of Southern Maryland's La Plata Campus, is a little known piece of American History. Founded approximately 216 years ago in 1790, the Mount Carmel Monastery was an early symbol of religious freedom in America. The Monastery was founded by Carmelite Nuns. The Nuns originally setup shop at nearby Chandler's Hope. However, since this location was so close to the bustling and noisy seaport of Port Tobacco, they arranged to swap their land with a Mr. Baker Brooke for 886 acres nearby - the site of the current Monastery. According to Mother Virginia Marie, the noisy environment of the seaport was not conducive to their mission of prayer and intercession. Since that time, the size of the current property has dwindled down to about 75 acres. In 1831, the Nuns left Port Tobacco to settle in Baltimore. According to an almanac published by the Nuns, there was a tradition in southern Maryland where the people would pray for the return of the nuns on the very day that they left. These prayers reportedly lasted for over one hundred years. The Nuns did not return during that time of prayer, but in 1933, a band of laity stepped in and began to restore what remained of the Mount Carmel Monastery. The faithful continued their hope that the Nuns would one day return. Approximately 43 years later, the prayers of the faithful were answered. The Nuns returned to the Monastery on May 10, 1976. 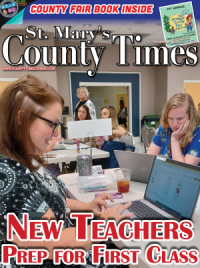 Just prior to returning to Port Tobacco, the Nuns settled in Great Mills, St. Mary's County, on December 21, 1973 while they awaited completion of the restoration work at the Monastery. The Carmelite Nuns of the Carmel of Port Tobacco remain there until today. In April of this year, the Nuns celebrated the opening of their new Pilgrimage Hall. The $1.5M facility is a gift from the parishioners and the Restorers of Mount Carmel in Maryland, Inc. The facility does a wonderful job of coupling old world architecture with modern building materials. The symmetry of the design coupled with classic lines and arched windows provides for a very handsome building. The combination of bricks, stone, tile, and wood provide a visually pleasing, yet durable and long-lived environment. The Carmelite life is a call to prayer, tempered with hard work and shared community. Since the nuns spend most of their day cloistered so that they can tend to this mission, they rely solely on the generosity of the public for their survival. Their new gift shop is one source of revenue for them. The Nuns will be celebrating the grand opening of the new gift shop this Saturday and Sunday (Sept 16/17) from 9 a.m. until 5 p.m. 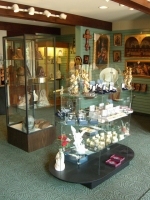 The shop contains an array of artwork, gifts, and spiritual books and resources. Paintings and sculptures which are hand-crafted by the Nuns will also be available. Those interested in the history of the Carmelites and the Monastery should make special note of the array of printed materials on hand. There is also a video tape titled, "The Garden of Carmel" which is 27 minutes long and tells the story of the Carmel of Port Tobacco in the Nun's own words. For the grand opening, volunteers will be on-hand to answer your questions. Refreshments will also be sold. The monastery only accepts cash and personal checks. Visitors may also register to win one of two door prizes. One is a hand-crafted Christmas wall hanging and the other is a framed photograph of Mother Teresa of Calcutta. A donation basket will also be available for those who would like to make an outright donation. Once the grand opening is over, the gift shop is normally not staffed. Sales work on the honor system. A calculator is available to help you calculate your total and payment can be left in a payment slot in the door. If you need help with a price or require change, you can use the intercom in the gift shop to communicate with one of the Nuns. The nuns spend most of their day cloistered so that they can tend to their primary mission of prayer and intercession. As such, you will not be able to communicate with them directly during your visit. However, they are happy to receive prayer requests. You can write to them or even send email. Contact information is available on their website which is listed below. 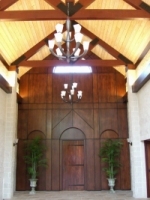 When visiting the Monastery, you may leave items or communications for the nuns via one of two turnstiles that are located inside the Pilgrimage Hall in the lobby and in the gift shop. If you miss the grand opening of the gift shop, the public is also invited to visit the monastery at any time. The grounds and the church are open to all. 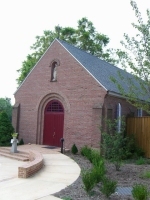 Mass is held daily at 7:15 a.m. in the red brick chapel. The supporters of the Monastery are also having a Christmas Sale on October 21 ( 9-5 ) and October 22 ( 9 - 4 ). The public is invited to donate items to be sold during the event. 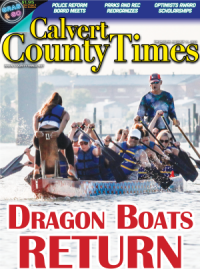 Those wishing to donate may contact Joanne on 301-848-2336 to make arrangements. You can find out more information by visiting their website at http://www.carmelofporttobacco.com/. For more information on the grand opening, please call Joanne MacGregor at 301-848-2336. 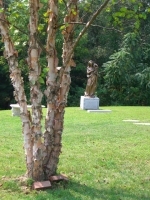 More information about the Restorers of Mount Carmel in Maryland, Inc. can be found at http://www.restorersmtcarmelmd.org/ . Notes: (1) History of the Carmelite Order based on information found in WikiPedia.